After celebrating July 4th, President Trump leaves Wednesday for the second foreign trip of his administration. He heads first to Warsaw, Poland, then to Germany for the G-20 meetings with the world's most powerful leaders. Trump's meeting with Putin: comes at an extraordinarily tense time for U.S.-Russia relations. Special counsel Robert Mueller is investigating whether the Trump campaign colluded with Russia to manipulate the election. And Congress is about to slap tough new sanctions on Russia. In a briefing last week, national security adviser H.R. McMaster said the President would "like the United States and the entire West to develop a more constructive relationship with Russia," but we're still yet to see Trump confront Putin over the election hacking. 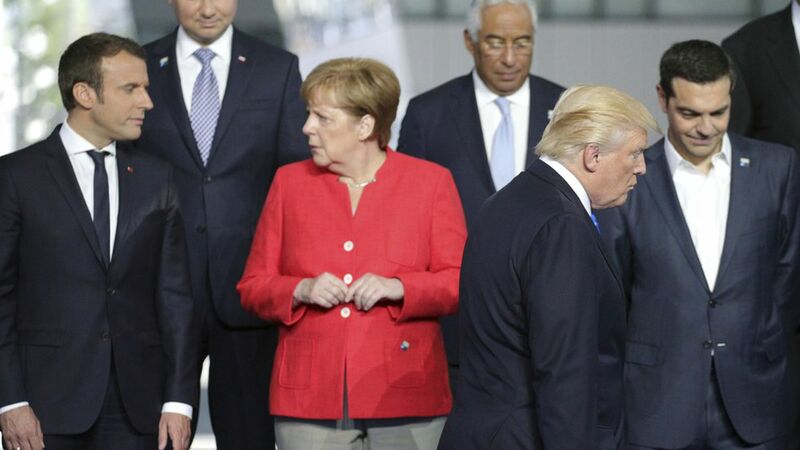 U.S.-German relations: Some are expecting a difficult interaction between Trump and Merkel, due to Trump's pulling out of the Paris climate change accord and his protectionist views on trade. One oddity that may bring Merkel and Trump together: the White House doesn't like the Senate's Russia sanctions bill, and the Germans hate it too. As the WSJ reports, the Germans and Austrians are describing the sanctions "as an illegal attempt to boost U.S. gas exports and interfere in Europe's energy market." Trump's meeting with Xi: They're having a warm-up phone call tonight, but U.S.-China relations are in a tricky spot. When Trump first met with Xi at Mar-a-Lago he emerged gushing about China and how it was going to help with North Korea, and so he didn't want to press too hard on trade. "Completely predictably," says a senior Republican foreign policy official, "the Chinese have done nothing of any substance regarding North Korea. In the past few days week, the U.S./Trump Administration has approved a weapons sale to Taiwan and slapped sanctions on Chinese businesses working with North Korea. Xi of course is all hurt and shocked. So the Trump/Xi meeting will be interesting. Is Trump now the wiser?"